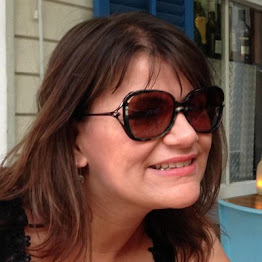 Here are some ideas for fashion looks for the summer, featuring some of my favourite pieces from my favourite brands. I love printed skirts and this pretty printed skirt from luxury brand Gilmar Lab, is very flattering on, skimming and non clinging, so cool for summer. Wear with a simple top in any of the colours that match the skirt print. This tote bag from Gilmar Lab is spacious and roomy and would be great for shopping. The flower design just makes me feel happy looking at it! Fit and flare dresses are superbly flattering on. The Balinese print fit and flare dress by Uttam Boutique is in a mint summer garden print and has a cute geometric waistband too. These gorgeous earrings by House of Fraser have a lovely warm rose gold colour and a touch of sparkle - simply stunning. House of Fraser have some great jewellery brands including Michael Kors, Pandora and Thomas Sabo. This patent fold over bag by Dune can be used day or night and adds some understated glamour to the dress. The soft metallic flat sandals by Italian company Fabi Boutique are the perfect pretty practical footwear. The rose metal detailing adds extra glamour - tres chic! This gorgeous dress in a contrast flower print from Coast could be worn at any summer occasion such as a day at the races, graduation or wedding. These stunning quartz earrings by Fabi Boutique are in a pretty lilac colour. Rhodium plated to keep their shine, I like the way in which they would move when worn. If I am going to wear heels I prefer wedges to a kitten heel. These wedge sandals, which are glamorous as well as practical, by Fabi Boutique have a patent t-bar with leaf detailing. Tell me which items are your favourite? That skirt in the top photo is just to die for!! If I had any money right now I would be out buying it right now! It's has such a cute print on it. I love it. Great skirt and very flattering too. It's a pretty mint colour you don't see that often. Great summer colours on the skirt! Love the stuff from Gilmar Lab and the dresses are divine too. Want it all! Yes they are very beautiful and have a great vintage look. Look 1 is amazing, that skirt is so beautiful and love the Michael Kors purse!! 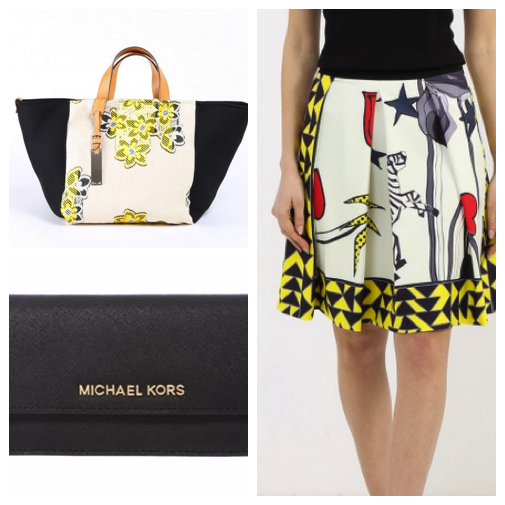 That skirt is outstanding, an amazing print and the Michael Kors purse is super too. Yes great looking sandals, aren't they? That top skirt is so pretty. I have been looking for something like that. A lovely summery print and just that bit different too.